Beginning with the paradox that characterizes the history of translation studies in the last half century - that more and more parameters of translation have been defined, but less and less closure achieved - the first half of Enlarging Translation, Empowering Translators calls for radical inclusionary approaches to translation, including a greater internationalization of the field. 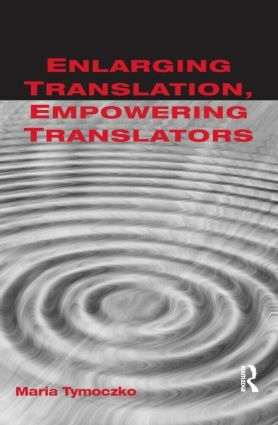 The book investigates the implications of the expanding but open definition of translation, with a chapter on research methods charting future approaches to translation studies. In the second half of the book, these enlarged views of translation are linked to the empowerment and agency of the translator. Revamped ideological frameworks for translation, new paradigms for the translation of culture, and new ways of incorporating contemporary views of meaning into translation follow from the expanded conceptualization of translation, and they serve as a platform for empowering translators and promoting activist translation practices. Addressed to translation theorists, teachers, and practising translators alike, this latest contribution from one of the leading theorists in the field sets new directions for translation studies.